Thursday | August 2, 2018	Say-Cheese! Chef Alex was invited to perform a demonstration on cheesecake recipes on a wonderful Friday at Angliss. Chef Alex worked closely with World Pastry Bronze Winner, Chef Francois Galtier, to present three cakes to the participants – Blubble Cheesecake, New York Cheesecake and Puffy Cheesecake. The cream cheese used in the recipes are lighter, reducing the time in mixing with the other ingredients. Enthusiastic attendees are chefs from hotel, restaurants and cafes. They get to watch the entire baking process and raised questions on the ingredients and recipes. 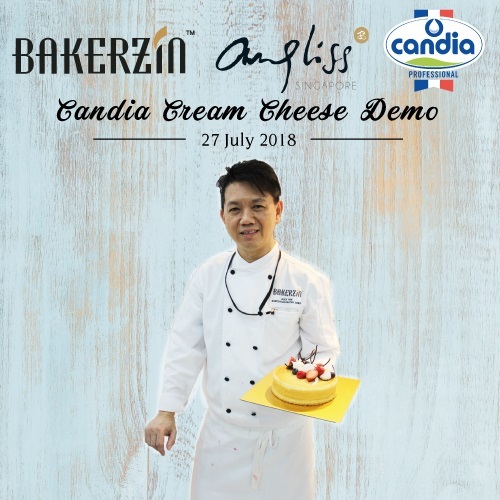 The event has drawn to a perfect ending with thunderous applause to Candia Cheese supplier and Angliss for providing the event venue.